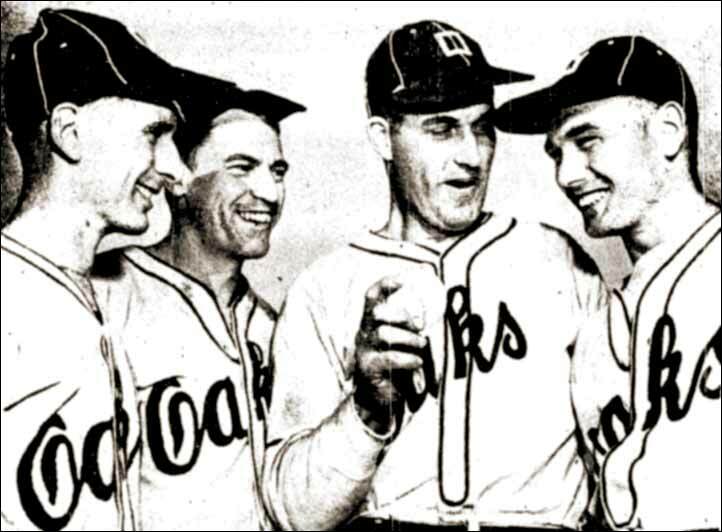 Veteran pitcher Al Yarnell has a laugh with teammates after an early season victory in the Toronto-area Viaduct League. The Oakville Oaks went on to win the Toronto city championship. Yarnell is second from the right, with centre-fielder Ben Languay at the right. Left is left-fielder Doug Wilson, and between Wilson and Yarnell is pitcher Jack Turner. Yarnell, the playing manager, was marking his 22nd year of sandlot ball in and around Toronto. 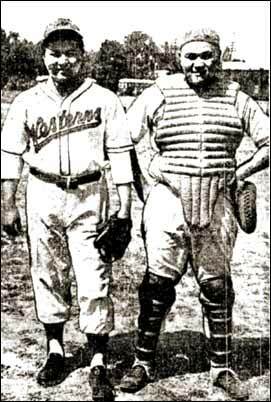 Key members of the Westerns of the West Toronto Senior League, pitcher Ken Mitsui (left) with brother and catcher Koei Mitsui. The Westerns, a Japanese-Canadian team, had joined the Toronto senior ranks with a team of their own in 1948.